Need some beach party ideas for your next pool party? 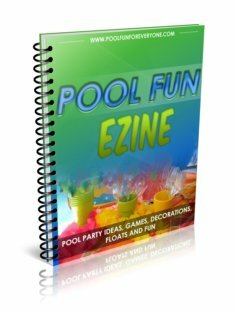 This is a colorful and fun pool party theme for kids and adults. 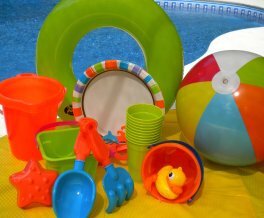 Colorful beach balls, swim rings, striped towels, and beach ball balloons all make for a great summer beach party. Beach party invitations can be store bought, custom ordered or uniquely your own. Don't under estimate the importance of the invite - they set the theme for your get-together, make people feel special, and build anticipation. There are several options of buying or making your own beach party invitations. 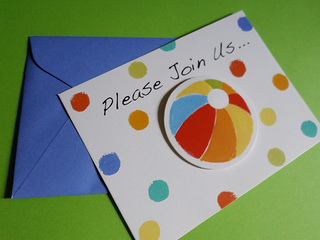 You can of course order custom invitations from companies like Vista print or on line. 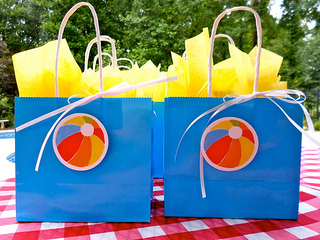 Real beach balls make the perfect beach party invitations. I found these fun pool party invites on line at Amazon. Write the invites on the deflated beach balls and put them in the handy container. They can be mailed or hand delivered. You can also get beach party invitations that allow you to fill-in-the-blanks for the party time, date and location. I love these Beach Party Invitations that were purchased from Amazon. I bought an extra set of invites and used just the beach balls for party tags on the party bags. What I love about beach party decorations are the bright colors like orange, yellow and lime green. 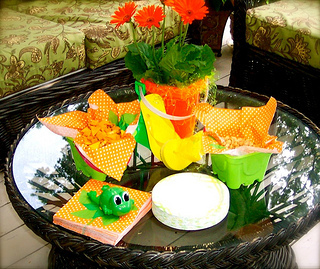 Use colorful sand buckets and sand toys to decorate with and even serve your food in them. Colorful cheap paper lanterns from the Dollar Store provide splashes of color on your table or hanging from a tree or patio umbrella. 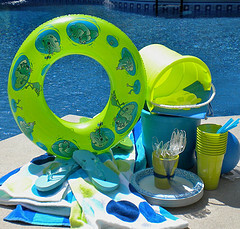 Get more ideas for floating pool decorations and pool party lights to make your beach party memorable. Decide on a color scheme and then stick to it starting with the invitations to the beach party decorations. 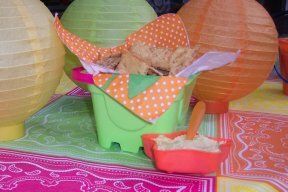 Any food becomes beach party food when served in a new bright colored beach pail or sand toy. Tasty wraps take on a new look when served in this new orange beach pail. 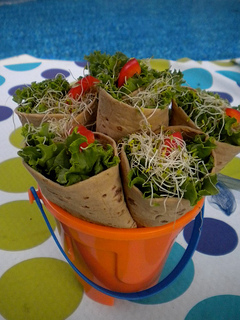 Make turkey roll-ups using thin slices of turkey, fresh lettuce, alfalfa sprouts, strips of red pepper, and mayonnaise. Other good ingredients to use are slices of avocado, tomatoes, cucumbers or onion. Give some extra flavor by using flavored mustard, like Dijon or our favorite is Pale Ale Honey Spice Mustard. Cream cheese sprinkled with some dill can be used as a spread as well. 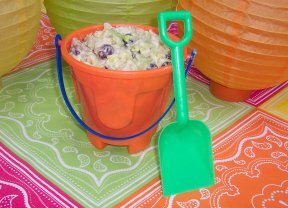 Serve the wraps in a new brightly colored orange sand bucket. Line a sand pail with a colorful napkin and put in your chips. Use a (new) sand shovel to serve the chicken salad. Mix to the consistency that you like. If it needs more liquid add some of the liquid from the drained chickpeas. We often serve salads at our pool parties and one of our favorites is chicken salad. If I am in a rush, I buy it from our local grocery store. Made with red grapes and celery it is really tasty. Serve it with a slice of cantaloupe and a bunch of green grapes. Serve fun "beachy" cupcakes for your beach party food. 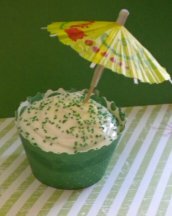 Wrap a colorful cupcake wrapper around the cupcake and top it with a "beach umbrella." Use brown colored sugar as sprinkles or just use a bright color like green, blue or orange. If you decide to make your own cupcakes, I found that store bought frosting works better than homemade frosting. On a warm or hot day, homemade frosting melts and the cupcakes don't look very fresh. The store bought frosting stays in place and looks fresh so you can keep the cupcakes outside until they are ready to be served. Place the cupcakes in a cupcake stand and use the stand as a centerpiece. 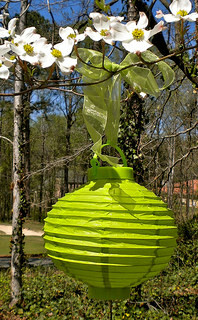 Cheap paper lanterns are a great way to provide color and a festive feel inexpensively. Decide on a color scheme for your beach party and then buy hanging paper lanterns in those same colors. 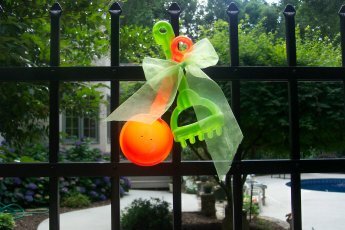 They are easy to hang on the ribs of your patio umbrellas or tree branches. We also place them from vines growing on our garden arbor so that the guests are greeted with a party feel right at the start. Outdoor parties require bigger ones than indoor parties - so be sure to get at least 14" lanterns or larger. 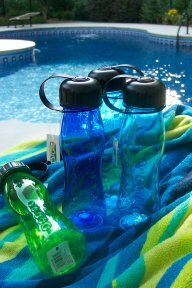 From water bottles to Koozie coolers send your guests home with a fun reminder of a special time together. 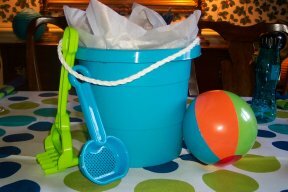 Fill new sand buckets lined with tissue paper with sunglasses, sunscreen and moisturizing lotion. 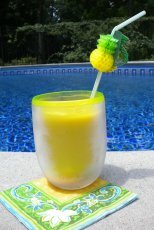 Fun coasters, insulated water bottles, fun sunglasses or cheap sun visors. What's a beach party without beach ball games? Here are some beach party games that work for many different ages. Just like hot potato get everyone in the pool to create a large circle. 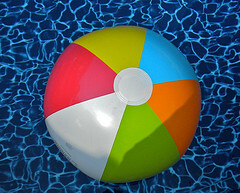 Toss the beach ball to anyone - it can be the person next to you or the person across from you. Play your favorite music or beach type music. Whoever is in possession of the ball when the music stops is out. Keep playing until there is a winner. Divide the guests into two teams. Provide some fun, goofy sunglasses and a beach ball for each team. Each player takes a turn swimming across the pool with the beach ball placed under them and wearing the pair of sunglasses. If the ball pops up, the player has to start over. Hand over the sunglasses and the beach ball to the next team member. The team that finishes first wins. Divide the guests into teams of two. See how many times two people can tap the ball to each other before it drops. The person or team that keeps it in the air the longest wins. 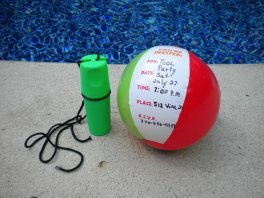 Beach party games for the pool can be as simple as water volleyball, using a beach ball instead. 4. Hoola Hoop Contest with a Light Up hoola hoop. Get the beach party music going and see who can hula hoop the longest. For daytime parties you can find these fun hoops at stores like Target or K-mart. Get two. Have two contestants start at the same time and see who can keep their hoop going the longest. For an evening or night time party, you can't beat a an LED lighted Hula Hoop. Get everyone in the pool and having fun with a beach volleyball game. Use a light up volleyball for evening pool parties. If rain is keeping you from the outside, move your beach party inside. Or in our case it wasn't the cold or the rain, it was record heat and humidity that moved our beach wedding shower inside. Decorate with colorful cheap paper lanterns, set out swimming pool floats in the corner of the room, and use sand buckets and sand shovels to serve the food.